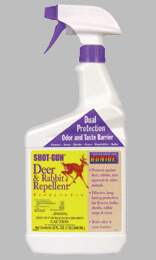 Shot Gun Rabbit Repellent (also works for deer) comes in a Ready-to-Use form and a concentrated form. Protects virtually any plant in the home landscape including flowers, shrubs, small trees, bulbs, annual and perennial flowers, vegetables, and fruit trees. This rabbit repellent combines a bad odor, bad taste, and burning touch barrier, by containing putresecent whole egg solids (bad smell), garlic (bad smell and bad taste), and capsaicin (burning sensation in mouth). It has all natural ingredients, leaving no noticeable residue. 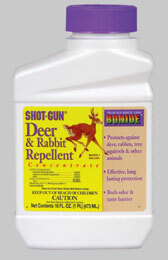 Shot Gun Rabbit Repellent lasts 3 months. Tips for protecting Landscape Plants – Shake the Ready To Use Shot Gun Repellent container well before use. Spray the leaves, stems, and branches thoroughly from all angles, until run-off or leaves look wet. One quart of Shot-Gun Repellent will treat about 40 to 50 ornamental shrubs 4 feet high or an area about 400 to 500 square feet.